Rich, buttery and just 5 cents each, Chicago Public Schools' iconic butter cookies made lunchtime all the merrier from the 1960s and through the ’80s. These classic shortbread cookies, pressed with three fingers for good measure and baked to toasty perfection, once graced cafeteria trays across the city. "They were the absolute best," says Gwendolyn Streak, who has worked in CPS lunchrooms for more than 19 years and now manages operations at Schurz High School in Old Irving Park. "Once you saw the lunch ladies serving up cookies in the cafeteria … it was officially a good day." Made from scratch, with lots of butter and lots of sugar, they're not on the menu anymore, since their fat and sugar content wouldn't meet today's nutrition standards. "But we still make them every once in a while, to share among the cafeteria staff," Streak says. Their origins are murky, and Chicago Public Schools has no record of where or when the cookies made their debut, but according to alumni lore, they popped up in the 1960s at both elementary and high schools throughout Chicago. The original recipe calls for just four ingredients — butter, sugar, vanilla extract and flour — but at some point, a peanut butter version appeared on the cafeteria scene. In later years, the made-from-scratch cookies were replaced by mass-produced, packaged goods. Today, the CPS Local School Wellness Policy clearly states, "No dessert-like items shall be served as part of any school meal," making CPS cookies cafeteria contraband. 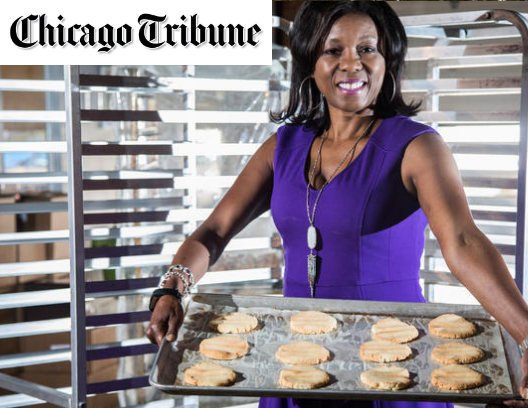 Yet two area entrepreneurs, Cheryl Crockett of Crockett Cookies and Diane Devroe of Lady Di's Bakery, have capitalized on the sweet nostalgia of CPS cookies. Crockett was working in the corporate world when a college friend shared her recipe for the cafeteria classic. "I adapted the recipe, hoping to re-create the happy school-day memories these cookies inspired, and brought some to a family get-together. From that day forward, I couldn't attend a family gathering without a batch of my cookies." A lightbulb went off, and Crockett began baking up lunchroom-style cookies in her own kitchen, then moved on to Kitchen Chicago, a shared kitchen space in West Town, as demand quickly grew. Today she operates Crockett Cookies out of a 4,000-square-foot facility of her very own on the Near West Side, delivering her prized cookies — available in both original butter and peanut butter — to more than 200 Walgreens and Whole Foods locations across the city and suburbs. She also sells her cookies online at crockettcookies.com, and will sell at walmart.com in 2018, she says. Crockett, who grew up on the South Side, fondly remembers the lunchroom treat from her own school days. "I made a point to maintain the imprint of three fingers, which ups the nostalgia factor," she explains. "People bite into my cookies and are transported back to their elementary school cafeterias. I regularly receive emails from customers thanking me for taking them back to the carefree days of childhood." Diane Devroe, owner of Lady Di's Bakery, sits in her office with bags full of her Chicago Public Schools-style butter and peanut butter cookies, waiting to be delivered. Diane Devroe, owner of Lady Di’s Bakery, recalls hoping and praying daily as a little girl that the buttery cookies would be on the cafeteria menu of her school, John Fiske Elementary in Woodlawn. As an adult, her gamble on a childhood favorite paid off in a big way. She invested her life's savings — $10,000 — on a down payment for a bakery, bartering with the previous owner to allow her to pay the remaining balance in monthly installments, and opened her dream, Lady Di's Bakery, in 1998, with just $2.40 left in her bank account. Today she distributes more than 20,000 containers every three days to restaurants, gas stations and convenience stores in Chicago and beyond. "I wanted to give back that taste of childhood," she explained. She opened the doors to her Ashburn bakery (4356 W. Ford City Drive; 773-885-4817) to the public after neighbors complained that the sweet smell of freshly baked cookies was tempting them daily. Devroe also sells her lunchroom-style cookies online at ladydisbaker.corecommerce.com. Success didn't come easy for Devroe, who pulled 18- to 20-hour days in the early years, while also raising three kids as a single mom. "I spent a lot of time crying and praying. I was always a hands-on parent, and I felt guilty that I was investing so much of my time in the business. I cried so hard I think my tears fell into my cookies and imparted them with emotion, like the movie “Like Water for Chocolate.” But despite all, God kept telling me to keep on going. And so I did." Devroe's work ethic built her business — now in its 20th year — and was passed on to her three kids, now entrepreneurial adults with children of their own. "My kids are hardworking and still very close to one other. And my grandkids are now my official taste testers!" Lady Di's CPS-style butter cookies are available in three shades: light (super soft and just barely baked), medium and dark (extra toasted). "Everyone has their shade preference,” explained Devroe. “I have customers that travel far and wide just to get a hold of my dark cookies." You can create the memories at home. The key to unforgettable CPS cookies is to use top-notch ingredients — don’t even consider substituting margarine for butter. Make your mark by using your three middle fingers to gently press the cookies down onto the ungreased cookie sheets before baking, just as the cafeteria bakers used to do. Follow Lady Di's lead, and bake the cookies according to your desired shade: 2 minutes more for an even toastier, crunchier cookie; 2 minutes less for a softer, chewier cookie. Developed by Amy Bizzarri from traditional recipes. Everyone has their personal shade preference for the cafeteria classics: bake 2 minutes more for an even toastier, crunchier cookie; 2 minutes less for a softer, chewier cookie. 1 Heat oven to 375 degrees. Cream butter and sugar together with an electric mixer on medium speed until fluffy, 5 minutes. Mix in salt and vanilla. Reduce speed to low; add flour in batches, mixing until well combined. 2 Roll dough into a 12-inch log; wrap with plastic wrap. Chill at least 4 hours. 3 Cut log into 1/4-inch slices; use 3 fingers to gently press the cookies down onto ungreased cookie sheets. Bake until edges are golden, 12-15 minutes. Developed by Amy Bizzarri from traditional recipes.The CPS cookie’s peanut butter cousin sometimes made an appearance in cafeterias across the city, much to the delight of students. 1 Heat oven to 375 degrees. Cream butter, peanut butter and sugars together with an electric mixer on medium speed until fluffy, 5 minutes. Mix in salt and vanilla. Mix in the egg. Reduce to low speed; add flour and baking soda. Mix until well combined. 2 Roll dough into a 12-inch log; wrap with plastic wrap. Chill, at least 4 hours. 3 Cut log into 1/4-inch slices; use 3 fingers to gently press the cookies down onto ungreased cookie sheets. Bake, 12-15 minutes.